Today, we’re gonna mix driving and hard bouncing cart paths. Driving as in hitting a tee shot and opposed to trying to control a vehicle. You’ll see that these trivial ingredients can produce ridiculously explosive long drives but also ridiculously funny situations. Most golfers love (or would love) to hit the ball long. Some are even willing to try almost anything to add a few extra yards to their drives. Aiming at cart paths and benefiting from big bounces off them sure can be an excellent way to hack it much longer. Any passionate golfer worthy of the name must have tried it at some point during his illustrious career. We hope you’ll think about this post next time you make an attempt at it. But beware this aggressive strategic as most cart paths are located on the side and unfortunate ricochets off them may often only result in getting further into trouble. Roy “Tin Cup” McAvoy (Kevin Costner) sure learned about hard-pan-insanely-long shots by hurtfully losing a thousand bucks to bad boy David Simms (Don Johnson). Simms even used the car path (the road) instead of the cart path to teach him his lesson with their now Famous 7 Iron Bet. Some time ago (ages ago if you must know), for young golf studs full of testosterone like my friends and me, reaching a par-5 in 2 strokes was the ultimate objective. Nothing could stop us; we would have bounced our heads off walls if we had to. So we only viewed cart paths as great opportunities to achieve our goal and had no complex using them to propel of drives farther. I remember a course we used to play 5-6 times each year. The 10th hole was a monster 560 yard par 5. The traditional line down the fairway didn’t give much possibility. A big hill always stopped well struck balls about 270 yards from the tee; from there, a 300 yard 3-wood was out of question even for the most talented of us. One day, we realized that aiming at the cart path to the right side would offer us a crack at an easy 400 yard drive; a precise 220-230 yard shot would tumble on the cart path and end up just beside the 150 yard stake. From that moment on, we averaged about one successful attempt per round within our foursome. The lucky daily winner usually was quite cocky about it; and the others could still manage a relatively easy layup from the rough. Access to this YouTube video (not in vogue back then) of Louis Oosthuizen’s 500 yard drive sure would have been pretty cool for us. Louis doesn’t look that pleased at first; sometimes, golf in a funny game where a bad shot flared to the right still results into the longest drive of your life. Similarities with our situation are quite amazing: Louis’ ball bounces and rolls in the same fashion; the raised edges also keep his ball on the cart path. The only difference is that, in our case, the path ran out around the 400 yard mark. Hitting long kangaroo-like drives off cart paths can be awesome but a little luck and good fortune still must be on your side. On occasion, even a perfect shot can result in disaster. Talk about it to Fred, one of our very long hitting friends. On a brisk yet beautiful July morning, we got to our infamous par 5, reachable in two via cart path (10th hole mentioned above). One of us (I don’t exactly recall who it was that morning, not me for sure) played his drive just in the correct spot; his ball rolled on the path and disappeared over the hill. We assumed it reached the usual prolific area. Fred was last and hit even a better drive. He bombed it on the right side of the path with a baby draw. His ball took two huge hops much further on the cart path. We all wowed and then, suddenly, Bang! We heard a single distinct plastic thud. We hurried to see what happened. To our surprise, the marshal (what a genius!) was there. Full of excuses, he was very sorry because the second ball (Fred’s) smashed in the windshield of his cart and badly ricocheted right. He pointed and there lied Fred’s ball, almost unplayable, just beside the trunk of a smallish tree. Fred had to play his next shot kinda backwards and finally scored an ugly 3-putt double-bogey. The irony didn’t end there as the first ball had rolled under the marshal’s cart, right between the tires and continued its merry way down the hill, to an easy 2-putt birdie. Hard to believe but Fred’s luck wasn’t as bad as Brett Rumford’s that got his ball kicked the wrong way by a (stupid) fan. As the following video shows, for a while, Rumford’s roll on the path looked almost identical to Louis Oosthuizen’s monster drive (see earlier video). But you know, to hit 500-yard drives: better be lucky than good! Not exactly related yet quite funny! 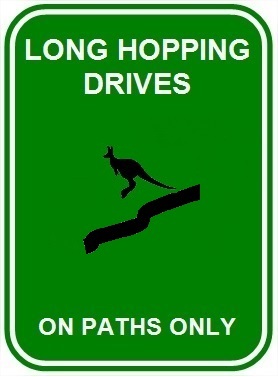 On some courses, when you «drive», remember to follow THE RULES and REMAIN ON THE PATH! I think these guys will remember the lesson! Kind of back on subject with this exotic bird deliberately bouncing a golf ball on the cart path more than once, as you can see, bouncing it can make you ecstatic! Nothing in the rule book prevents you from aiming at cart paths and trying to bounce your ball on them to get more distance. So feel free to take advantage of poorly thought out designs that offer you straight cart paths too close to the edge of the fairway or just in the corner of a dogleg. You just have to live with potential dire consequences like hopping out of bounds, in a lake or deep in the woods. Furthermore, hard cart paths pavement will often scratch your ball and can damage it a little. Note that in most situations, you won’t be able to replace your ball right away. The rules will only permit to replace the ball after the completion of the hole because it probably won’t be considered «unfit for play». A ball is unfit for play if it is visibly cut, cracked or out of shape. A ball is not unfit for play solely because mud or other materials adhere to it, its surface is scratched or scraped or its paint is damaged or discolored. If the ball comes to rest on a cart path, two options are available to proceed from that position. Most people will simply take a free drop but the ball could also be played as it lies on the cart path. Most times, the latter option isn’t really practical because it can damage the golf club. You may have better luck with softer gravel or dirt paths that can be a bit more suitable to play from. If the player opts to take relief from a cart path, he is allowed, without penalty, to drop within 1 club length from closest point of relief and no nearer the hole. 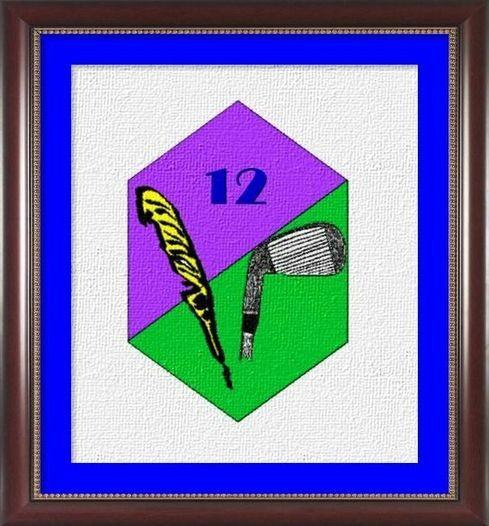 A quick remember to know if you get 1 or 2 club length relief: free relief with no penalty (less strokes) = only 1 club length and more severe relief with penalty (more strokes) = 2 club length. So, for instance, you would get only 1 club length for free relief from a cart path but a 2 club length relief with a penalty of 1 stroke from an unplayable lie. Note that the player cannot choose on which side of the cart path he will drop. If it is determine that the closest point of relief is to the right side of the cart, he won’t have the option to drop left of the path. This also means that from the same original ball position on the path, right and left handed golfers may often drop on opposite sides of the path. 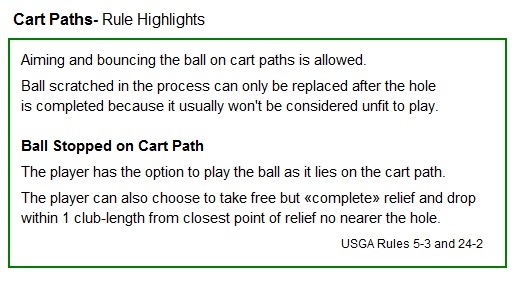 Furthermore, getting relief from a cart path, the player must take “complete relief”. When a player is taking relief from an immovable obstruction, he must determine the point where there is no interference from the lie of ball, stance, and area of intended swing. For example, if the ball lies on a cart path, the ball must be dropped at a point where the cart path does not interfere with the lie of the ball, his stance, and also the area of intended swing. If the ball comes to rest in such a position, it must be re-dropped (Rule 20-2c(v)). So, complete relief means that, for instance, you have to redrop even if you like your lie but you foot is on the path when you take you stance. That it for us today! Hope our little journey hopping on cart parts was instructive and enjoyable for you. 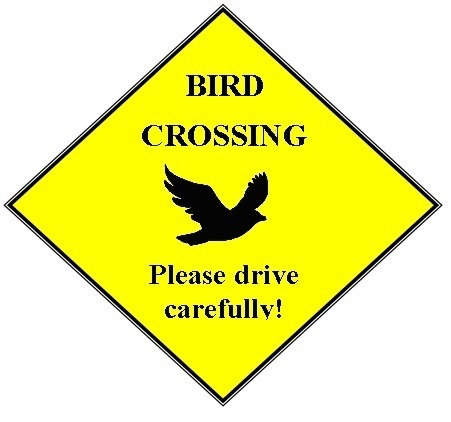 And in both senses of the word, please always drive carefully!